You are death incarnate, a destroyer of worlds whose fate is to be felled by your own hubris. This isn't the PokÃ©mon you're used to. There are few games that exemplify collecting better than the PokÃ©mon series. Every byte of the game is designed to tap into people's urge to collect with colorful monsters to nab in meadows and gym badges to win from powerful trainers. There's one Pokemon game, however, where the collecting is cast in a different light. 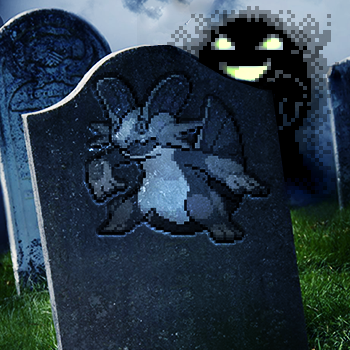 In Issue 282 of The Escapist, Brendan Main looks at the spooky PokÃ©mon Ghost Black, where players collect little more than the names of the dead. As the story goes, this version plays out essentially the same as its original, but with one major addition to your roster - beyond your starter pokÃ©mon, there is a nameless, unidentified Ghost, a hazy smear of pixels that lurks at the back of your party. It cannot be dismissed or set free. Stranger still, it cannot be harmed at all, paralyzing opposing pokÃ©mon in their tracks with fear. The Ghost has a single ability, "Curse," that does far more than chip away at its opponents' life totals. When used, the screen cuts to black, the targeted pokÃ©mon screams, and then ... it's gone. This curse can also be used on opposing trainers after the battle for similarly morbid results. Soon, tombstones litter the roads, transforming the once-populous Kanto region into a literal ghost town. A dark tale, but it gets darker. The game's end is followed by an epilogue that depicts your trainer as an aged man, standing in a vast mausoleum filled with your now-deceased pokÃ©mon. You slowly walk back to your hometown, passing through rows of graves marking the victims of that ghostly pokemon's curse. After arriving home, you are greeted to an odd sight - one by one, the spirits of the pokÃ©mon you killed appear before you, followed by those trainers slain at your hand. Finally, your old pal Ghost appears - but this time, "Ghost wants to fight." With no pokÃ©mon of your own, you can only stand paralyzed as he inches closer. You struggle, and your health bar whittles away from your own desperation. Finally, the Ghost casts his curse, you hear a scream, the game cuts to black ... and then nothing. Just an empty screen. You have to reset the game to continue. But when you turn the game back on, there's nothing there - the save file is gone. Fortunately - or perhaps sadly - Ghost Black doesn't exist, but it does raise the question of what fate awaits our PokÃ©mon collections ten, twenty, even fifty years down the line. You can read more about it in Main's article, "Ghost Type Story."